SHOOT WATER: Press the button and the fire truck will shoot water to long distance. Your little kids will have great fun in playing as firefighter role to shoot water by pressing the button and control the water direction by turning the water orifice. EXTENDED & ROTATING LADDER: The ladder of the fire truck can be extended and rotating as well, so that kids can extend the ladder to the length they needed and rotating to different angles nearly 360 degrees, reaching the better playing effect in the pretending fire game. 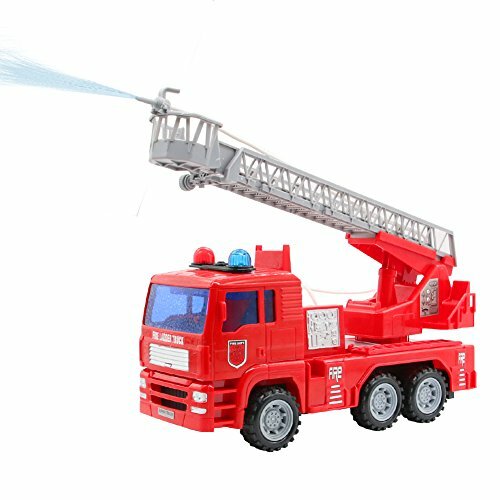 REALISTIC FIRE TRUCK: The fire truck contains the flashing red and blue lights with sirens sounds, so that it may be helpful for kids to imagine the rescue activities as the firefighters, having fun in the playing with this fire toy. IMAGINAIVE EDUCATION TOY: This fire rescue truck is a great education tool for kids, for it helps to cultivating the toddlers fire protection consciousness and emergency situation handling, so that children can protect themselves in the danger to some extents. WELL MADE DESIGN : All parts of the fire truck are in durable and safety plastic, keeping the kids from danger and poisons, extending the playing lifespan of the toy truck, becoming one the good accompany toy friend for kids during their childhood. Yoptote Fire Truck Rescue ladder toy that shoots water.